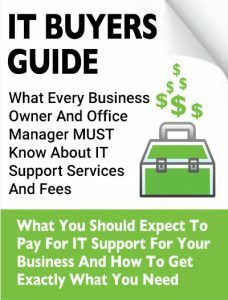 How Much Does It Cost To Outsource Your IT? Are you wondering what it would take to FINALLY end the nightmare of computer network frustration, know that you are actually secure from cyber threats, sleep great at night knowing that your system is backed up and able to withstand the worst case scenario, and be able to maximize productivity with computers that actually work the way they are supposed to? How to make sure you know exactly what you’re getting to avoid disappointment, frustration and added costs later that you didn’t anticipate. 21 revealing questions to ask your IT support firm BEFORE giving them access to your computer network, e-mail, and data. Complete the form on the right to receive your FREE copy of our exclusive educational guide, and learn for yourself what you should expect to pay and what you should expect to get when outsourcing your IT. If you are the owner or office manager of a business in Jacksonville, Tallahassee, Virginia Beach, Norfolk, or Chesapeake that is currently looking to outsource some or all of the IT support for your organization, this report contains important information that will be extremely valuable to you as you search for a competent firm you can trust. At On Call Computer Solutions we’ve been providing IT services to businesses, non-profits, associations, government contractors,and the government since 2003. You may not have heard of us before, but I’m sure you’re familiar with one or more of the over 2500+ organizations who have turned to On Call Computer Solutions for help with their Computer Network, Cyber Security, IT Compliance, Cloud Solutions, Data Backup, Websites, Internet Marketing, Telephone Systems, and Large Scale IT Projects . 1) I wanted an easy way to answer this question and educate all prospective clients who come to us on the most common ways IT services companies package and price their services, and the pros and cons of each approach. 2) I wanted to bring to light a few “industry secrets” about IT service contracts and SLAs (service level agreements) that almost no <<business owner>> thinks about, understands or knows to ask about when evaluating IT service providers that can end up burning you with hidden fees and locking you into a long-term contract when they are unwilling or unable to deliver the quality of service you need. 3) I wanted to educate you on how to pick the right IT services company for their specific situation, budget and needs based on the VALUE the company can deliver, not just the price, high OR low. In the end, my purpose is to help you make the most informed decision possible so you end up working with someone who helps you solve your problems and accomplish what you want in a time frame, manner and budget that is right for you. On Call Computer Solutions, LLC. On Call Computer Solutions is an IT Support and Computer Services company serving Tallahassee, Jacksonville, and Virginia Beach. We know businesses like yours need technology support in order to run highly-effective organizations. Leverage pro-growth technology services for your company now. Contact us at Tallahassee (850) 783-3012 | Jacksonville (904) 513-9006 | Virginia Beach (757) 349-8768 or info@on-callsupport.com.